Journalist and novelist John DeDakis (pronounced deh-DAY-kiss) is a former editor on CNN's "The Situation Room with Wolf Blitzer." DeDakis is the author of three novels in the Lark Chadwick mystery-suspense series: Fast Track, Bluff, (ArcheBooks) and Troubled Water (Strategic Media Books). In Fast Track, Lark solves the mystery of a car-train collision that orphaned her as an infant. In Bluff, Lark investigates the death of Holly Stone, the daughter of her friend and mentor Lionel Stone. To research the story, DeDakis hiked the Inca Trail to Machu Picchu in Peru. DeDakis is currently working with Pittsburgh psychologist Joyce Wilde on a self-help memoir about their mutual losses (working title: "Healing from Grief: A Conversation"). DeDakis is also working on his fourth novel in the Lark Chadwick series (Working title: "Bullet in the Chamber"). He is working with agent Garry Dinnerman of Beverly Grant Associates (BGA) to bring the screenplay adaptations of his novels to the attention of Hollywood. John's literary agent since 2004 is Barbara Casey. DeDakis is a manuscript editor and writing workshop leader. During his nearly 45-year, award-winning career in journalism (25 years at CNN), DeDakis has been a White House Correspondent and interviewed such luminaries as Alfred Hitchcock, Jimmy Carter, and Ronald Reagan. He lives in Washington, D.C. and teaches journalism at The University of Maryland – College Park. 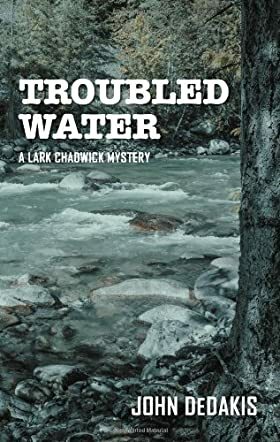 Troubled Water is the third in John DeDakis's United States-set crime thriller series featuring Lark Chadwick, a young and ballsy investigative newspaper journalist with a nose for a sharp headline, a clever angle, and the solving of murders. This book sees Lark leave her Wisconsin home, job, and friends for a new post in Georgia. Moving from the weekly Pine Bluff Standard to the daily Columbia Sun-Gazette is already a change of pace, but she also finds herself a reluctant part of the story when, on her first night in town, she almost literally stumbles across the body of a teenage girl. Within days, a second victim is found in the same spot and Lark is determined to identify the killer. She finds that she is not short of suspects, and worries that one or two may be taking a personal interest in making her the next headline. Troubled Water is the first of John DeDakis’s books I’ve read, but the excellent story largely stands alone and does not rely on previous knowledge. Lark is a prickly but likeable heroine, and both a professional and compassionate reporter. DeDakis’s own background and experience as a journalist is evident throughout the book and provides an interesting angle on the whodunit genre. The story is well paced and developed and is a very easy, smooth read, which keeps you guessing until a very effective reveal. I was convinced I knew the identity of the murderer, and was completely wrong! I’m very pleased I’ve discovered the world of Lark Chadwick. I can wholeheartedly recommend Troubled Water and will definitely be reading the earlier books in the series.